It's almost time for the Passover seder. Tomorrow night Jews all over the world will sit down for the first (and in Israel the only) seder. We don't know how many sedarim comedian Jackie Mason will attend, but if this video clip is a sample, it looks like it will be a stand-up affair. But surprisingly, not stand-up comedy. 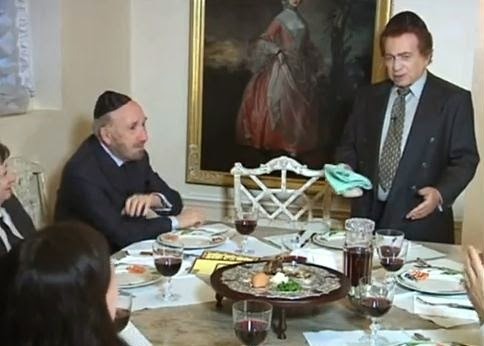 Jackie shows that he can conduct a seder standing up, even though he moves the afikoman up from its place at the end of the seder to an earlier appearance. There are a few other missteps, but for the most part, he follows the traditional sequence as outlined in the Haggadah. We were surprised to see that he went through the basics of the seder without cracking a joke or even a smile. To to his credit, he showed a basic knowledge that he acquired in Sheboygan, Wisconsin and on the Lower East Side of Manhattan when as Yacov Moshe Maza he followed his brothers into the rabbinate. This may well be the only serious video of Jackie Mason. We'll be back in future posts with funny ones. Be sure to watch for tomorrow's Joke to Start the week, even though it's Erev Pesach. Frankly, I'm tremendously disappointed. There are dozens of videos which are better , i.e. have better tunes, more meaning, and better presented. From Jackie Mason, I expect funny, not his attempted breakthough into chazzanut. The deMille clips were cute. Nonetheless, I wish him a happy and kosher Passover, and I'm not going to finish watching. After all, Pesach is coming. For a blog that is called "Jewish HUMOR Central" there is not enough humor here at all. When this is humor, it's usually very funny, but I want more of it.